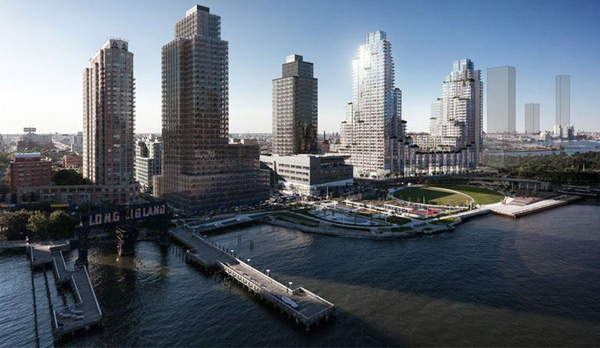 TF Cornerstone | Hunter's Point South | 1-50 50th Ave.
A long-delayed project in Long Island City could finally start getting off the ground after being stuck in limbo for years. The project — an apartment complex with 1,197 units that is part of Hunter’s Point South — was approved about 3.5 years ago but has faced countless delays since then due to a train tunnel and utility lines that run below the site, according to Crain’s. Developer TF Cornerstone , which was chosen to construct the project in December 2013, changed its building design last year due to these hurdles, but Amtrak and the New York Power Authority still need to agree to the design of the building and ensure that it will not damage their infrastructure. Amtrak negotiations have been ongoing for more than two years but are almost done. Other components of Hunter’s Point South are also progressing, and the building may be ready to start construction by the beginning of 2018. The Hunter’s Point South redevelopment would bring a total of 5,000 housing units to Long Island City, and officials expect to finish infrastructure on its second phase next year.